We regularly order our stationery from 221 Print, they always provide a very friendly and efficient service. 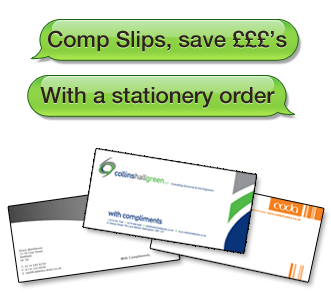 If you want an alternative to a letterhead, but a professionally printed solution to accompany any mailing, why not take advantage of our cheap comp slip printing offer. These compliment slips are usually sized at 210x99mm and fit easily into a dl envelope, they are generally printed full colour on 120gsm paper. If you order any amount of colour letterheads, we will print the same amount of comp slips for half price! We can even do these on our same day printing service. Remember this offer is open throughout the year - not just the january sales. Colour printing is for life - not just christmas! Especially in SHeffield.